Aloe Ferox products provide excellent quality at affordable prices. More and more users of expensive imported skincare ranges opt for the Timeless Skincare Range. For hundreds of years, the aloe plant has been known for its healing properties. Today this knowledge has been harnessed into a range of Wellness and Skincare products that are created from this “lily of the desert”. The soothing and rejuvenating qualities of the aloe are what make these products so popular. A well-researched method of utilizing the whole leaf of the aloe and not only the white inner gel makes Aloe Ferox products unique. The application of applying aloe for a wide range of conditions is as timeless as the mountains and rocky hills the plant grows best in. Ancient knowledge of medicinal plants passed down from generation to generation, has in recent years become an increasingly important research area for pharmaceutical, wellness, and cosmetic companies. In the oldest references, Egyptians recorded aloe’s role in hygiene and religion in carvings on the Pyramids, while Southern Africa’s Khoi and San depicted its use in rock paintings. Respected Greek, Roman, Hebrew, Arabian, Chinese Indian, Mexican and West Indian healers also prescribed aloe, while scholars noted its benefits. For centuries indigenous healers have treated man and beast successfully with aloe preparations. In Xhosa culture, it is applied to fresh and inflamed wounds to encourage healing and is a known cure for ringworms and tapeworms, boils and ulcers. Aloe is used to treat enteritis in calves and fowls, as well as roundworm in the Zulu culture, while the Pondo mix aloe juice and water for a refreshing body wash. An extract, bitters, is ingested to help with detoxification, as well as gout, rheumatism and arthritis, stomach and digestive ailments. Other recorded uses include insect bites and bluebottle stings, fungi, toothache, sunburn, as protection against the elements and to stimulate the immune system, to name a few. During the age of exploration, Spanish mariners realised the plant’s value and carried aloe on board to treat cuts, burns and chafing, while missionaries further spread word of its uses through the New World. This news sparked an explosion in the Aloe vera market in the US, giving the species celebrity status in the wellness and beauty industries. Africa, on the other hand, boasts over 300 species of aloe. The most beneficial of these is South Africa’s Aloe ferox, or Cape Aloe, which is one of very few plant species that enjoys the honour of being depicted in San rock art. A proud sentinel along the roads and rivers of the Hessequa, the entrance to the Garden Route near Albertinia, the robust Aloe ferox has thicker leaves than it’s famous cousin. These are covered in short and stubby thorns to protect it from herbivores and harbour the valuable gel and bitter sap that are harvested. Aloe ferox plants grown in this area, in particular, have been proven to have 36% more total amino acids in its gel and 20 times more of the bitter sap containing the beneficial substance aloin than Aloe vera. Local specimens have the highest aloin content in the country – and therefore the world – at up to 28% of the bitter sap. In contrast, Aloe vera contains very little bitter sap and therefore very small amounts of aloin. For years, the bitter sap has been harvested and exported to Europe and Asia for inclusion in a range of products. 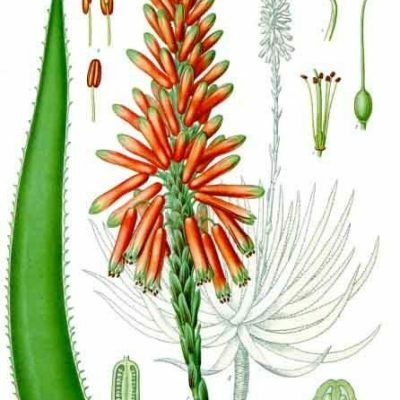 New research is ongoing, with one study in Japan in 2006 suggesting that Aloe ferox’s tumour reducing properties are not due to any one compound, but the synergistic effect of a combination, once again illustrating the power of this gift from nature.